This article was originally published on Aug. 2 in the Toronto Star. During the recent all-star break, Major League Baseball (MLB) commissioner Rob Manfred discussed the state of the game. Although the All-Star Game is normally a time for celebration, Manfred did acknowledge that attendance figures have notably declined this year. 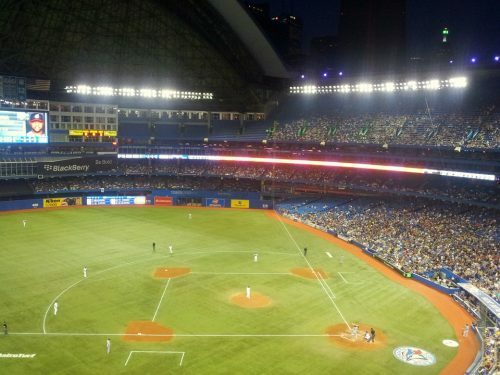 The Toronto Blue Jays represent the American League team with the most pronounced decrease in fan attendance. Manfred drew attention to ways MLB can enhance fan interest. The encroaching influence of analytics was raised and possible rule changes were mentioned, such as limiting defensive shifts and the number of relief pitchers brought into a game. But the underlying reason for a declining audience appears to be the lack of contending teams — in the American League at least — and a large majority of teams having many games still to play with little purpose. The all-star break is symbolically the midpoint of the season. It is a time for management to reflect on their team’s performance and determine if they are regarded as competitive for a potential playoff berth. Based on their assessments, teams are typically classified as “buyers” or “sellers” in anticipation of the July 31 nonwaiver trade deadline that just passed. At the all-star break last year, the Blue Jays were in last place in their division with a .466 winning percentage, yet the team was merely five games behind a playoff berth. The distinction between “buyers” or “sellers” was not so clear for most teams last season. Given the New York Yankees and Tampa Bay Rays were the wild card playoff occupants based on the 2017 all-star break standings, and the Blue Jays had numerous games remaining against these teams by sharing the same division, fans had reason to remain engaged and hopeful. Fans could imagine that if the team had a hot streak, they might be playoff-bound. With a comparable winning percentage (.453) at this year’s all-star break, however, the Blue Jays clearly had little hope for playoff qualification and were “sellers” at the non-waiver trade deadline. J.A. Happ, the team’s lone representative at the 2018 All-Star Game, was traded to the Yankees soon after getting the save in the American League’s win against the National League. Injury updates for popular players, such as Josh Donaldson and Marco Estrada, often focused on speedier recoveries enhancing their trade value rather than seeing them back on the field as Blue Jays. Canadian reliever John Axford’s last outing as a Blue Jay was regarded as improving his trade value and he is now a member of the Los Angeles Dodgers. Although understandable that Blue Jays management was attempting to strengthen its farm system and get what it could in return for players that have expiring contracts at year end, it is demoralizing for fans to see their team depleted and left resembling a minor league team while big-league prices remain to attend a game. Last season there was a considerable clustering of teams with winning percentages around .500. Such parity meant fans for most teams had reason to stay engaged. The Yankees and the Rays had winning percentages of .523 and .522, respectively, in the 2017 all-star break standings. The Minnesota Twins, who qualified as the second wild card team, had a .511 winning percentage at the break. The gap between the top and bottom American League teams this year is considerable. And this is most apparent in the American League East division, where the separation between the Boston Red Sox and the New York Yankees from the Tampa Bay Rays, Toronto Blue Jays and Baltimore Orioles is substantial. Baseball fans, unlike other major professional sports fans, are normally encouraged to check in regularly about how their team is faring, with games being played almost daily. But this season, like the Blue Jays, the large majority of American League teams are “sellers,” playing with little purpose, despite two months of games still on the schedule. Now that the Blue Jays are in rebuild mode, the team’s fans might be better served making the trip to Buffalo, where top prospect Vladimir Guerrero Jr. is debuting for the team’s top affiliate.